I also found the matching shoes for $3 - here they are just out of the washing machine. My son has been burning through winter coats this season. He just poked a hole in a brand new Gymboree coat so now I need to find a cute patch to cover the hole. He also broke the zipper on his last (thrifted) North Face coat so instead of replacing the zipper I just got him another one for $13 - I'm guessing it would cost at least that to fix it. Needless to say I tested the zipper (multiple times) on this one before purchasing it. Despite the cold weather I've been trying to think ahead for Spring so I picked up this cute Helen Wang strapless cotton gingham dress for $8. Note the cute ruffle at the top. It's a smidge big but wearable. The stretch cotton is so flattering - plus the top is boned for a better fit. That day I also dug through the pile of of wallets and found this gem for $4. As soon as I saw the Medusa I grabbed it LOL. I adore Tracy Reese - she's so girly and playful and she cuts for real women. And for 8 bucks you can't go wrong :) I actually followed the woman putting out skirts after I spotted this across the room. She finally figured out I was shadowing her and offered it to me LOL. Close up of embroidered silk skirt and wide belted waistband. Yeah it's a 2 but I'm 10 lbs away from zipping it up - I WILL fit this skirt! Love these $3 Naturino boots - they are waterproof and I look for them in every size for my kids. Unlabeled metallic leather skirt - only $8! 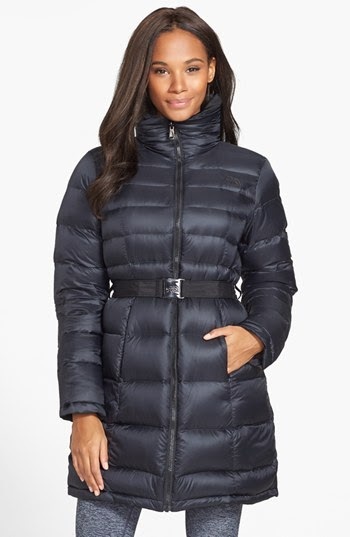 Gap lightweight down jacket - very moto inspired. It's a little tight but for $4 I'll save it for my girls - or for me when I loose more weight :) All the thrifted small jackets I got last year fit now so I'm hoping to size down again by next winter. $15 suede boots! All I need is my suede brush and they'll look as good as new. I've been watching this Sultra curling wand for MONTHS! If finally dropped to $29 (retail $145) and the Chi hairspray was just $3! Close up of floral applique. A little grandma but in an interesting way. The most exciting part of this Marc Jacobs dress - $129 from $1,799.99. Insane. Marc Jacobs for over 90% off? Yes, please. I was hoping to get this up earlier but I spent Wednesday evening at the ER with my son (and other 2 kids) after he mangled his finger in school - still not clear on exactly what happened. For some reason my husband is always at work when one of my kids needs stitches or an ER visit. Luckily my niece was in town and it was sooo helpful having an extra set of hands at the hospital (thanks Y!) His finger was so messed up they couldn't even stitch it up - they just poured glue all over it. He's fine (thank goodness) and was happy to not have to do homework that night LOL. My rules - please read! Prices are listed and do not include Paypal fees and exact shipping unless you are picking up from me locally. No resellers - I know how to Ebay too. This time I've added a small (20% or less) mark-up to the prices to compensate me for my bargain-hunting time. If you want to meet up you have three days to meet me or the item goes to the next in line. No returns as I'm not Walmart so know your size and ask questions as needed. Pet free, smoke free home. Close friends and family have first dibs for the first 48 hours and then it's open to all my readers :) If you're interested in anything contact me here or on my Shoppinggalnyc Facebook page. Tory Burch NWT Rosemary navy, black and white embellished tweed dress size 10, retail $425, my price $180. Very ladylike and the detail at the sleeve and neckline is gorgeous. Very UES - channel your inner Charlotte. Measures 15.5 inches across at the waist and 20 inches across at the hip. 41 inches long from shoulder to hem. Tory Burch's dress is crafted from mid-weight tweed with a metallic thread throughout. 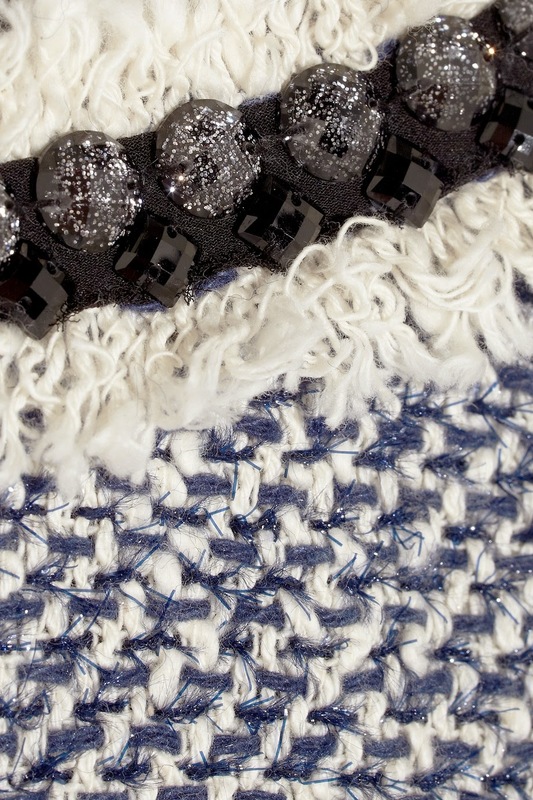 Faceted crystal embellishment and white frayed trims give this smart style glamorous appeal. TAKEN Tory Burch Rosemary dress in navy combo. 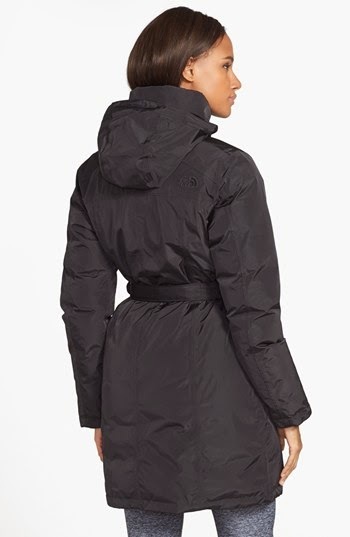 The North Face Danella reversible down jacket in black, size small. the retail is $399, my price $130. This is a refurbished jacket from Nordstrom so it does not have the original tags but it looks new. The size chart says it's a 4/6. I would have kept it but it's a little snug on bottom (I wear a 4 on top and 6 skirt) but it does zip up on me. I'm guessing it would probably best fit a size 4 - or a non pear shaped small 6. Create a breathable barrier against wet weather in a toasty performance jacket that reverses from a waterproof HyVent® 2L shell to quilted, water-repellent nylon ripstop. Whichever way you wear it, the layer is warmed by lofty 700-fill power made for mountaintop conditions. 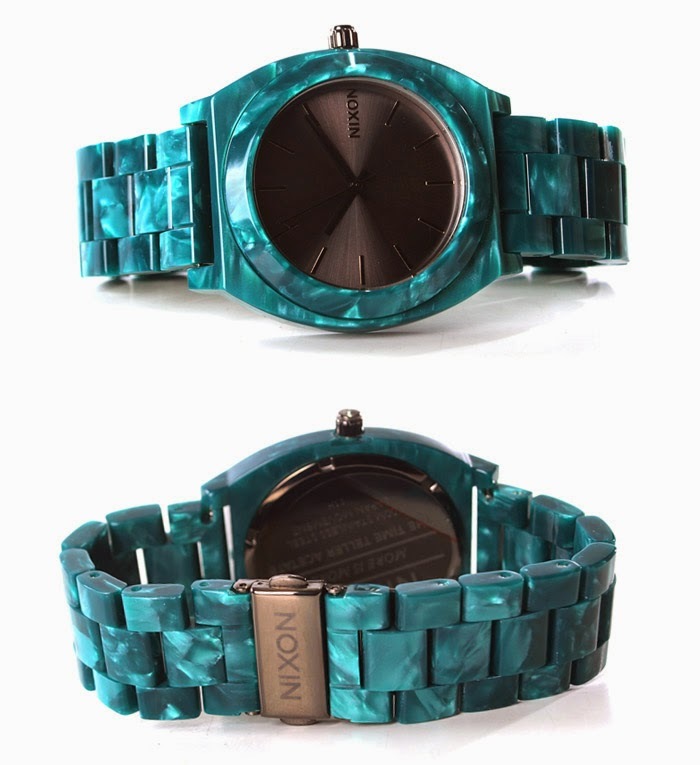 Removable belt with buckle closure. Zip front pockets; chest pocket. Lined, with 700-fill power goose down insulation. 100% polyester and 100% nylon. Measurements are as follows: 34 inches long from shoulder to hem, 17.75 inches across at the waist (unbelted) and 20 inches across at the hip. RETURNED The North Face Danella reversible jacket, size small. 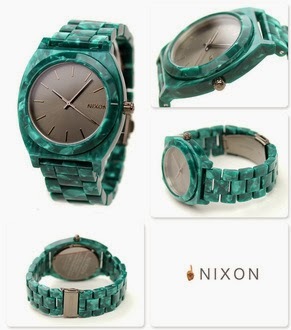 Nixon The Time Teller Acetate watch in green. 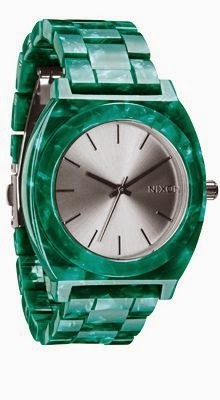 It's an oversized boyfriend style watch. 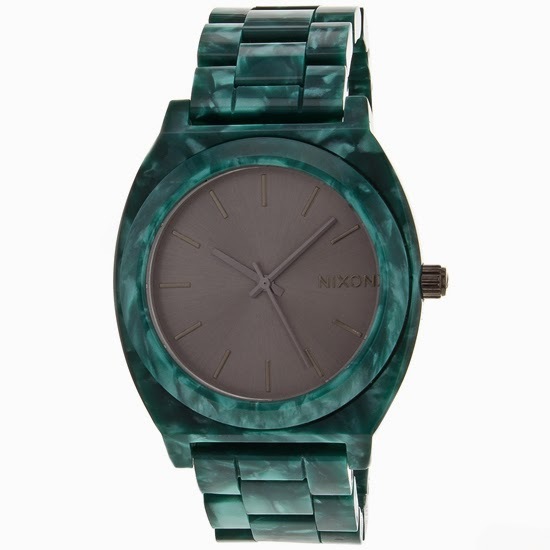 This watch is so pretty - I got one for myself too LOL. Retail $150, my price $55. Brand new but no box or original tags. Thrifted Amour size 7 vintage blue heels - super cute but they didn't fit my friend Sheev or my niece M. Probably more like a 6.5 than a 7. Insole measurement is approx. 10 inches long and the heels are 3.5 inches high. The color is amazing (cross between a cobalt blue and purple) and there is something so current about them. Pretty sure they are leather. By the right heel (by the insole - see pic) it looks like something is sticking up from the inside but neither person who tried these on noticed feeling anything, and I just wanted to mention it. Asking just $5. They show very little wear, even on the sole. A number of my friends have asked for a Burberry jacket so when I saw this one I grabbed it even though it wasn't crazy cheap. 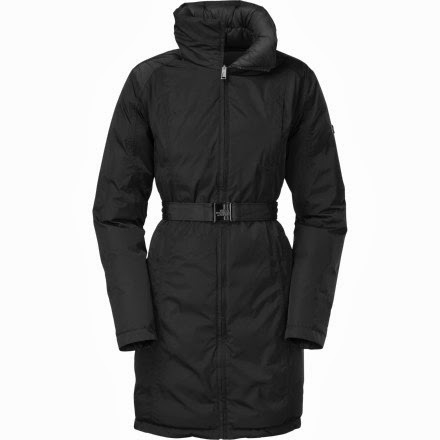 It's the Burberry Brit Ashlington black quilted jacket in size XS. I tried it on and I could get it to close but it's best for a 2/4. Retail $650, my price just $275. And no, they didn't have anymore in any other sizes - this was the last one in the entire company - I checked! A tonal belt defines the waistline of a diamond-quilted jacket designed with long raglan sleeves and a single gunflap. Approx. length from shoulder: 26". And that's all for now :) Have a great weekend! 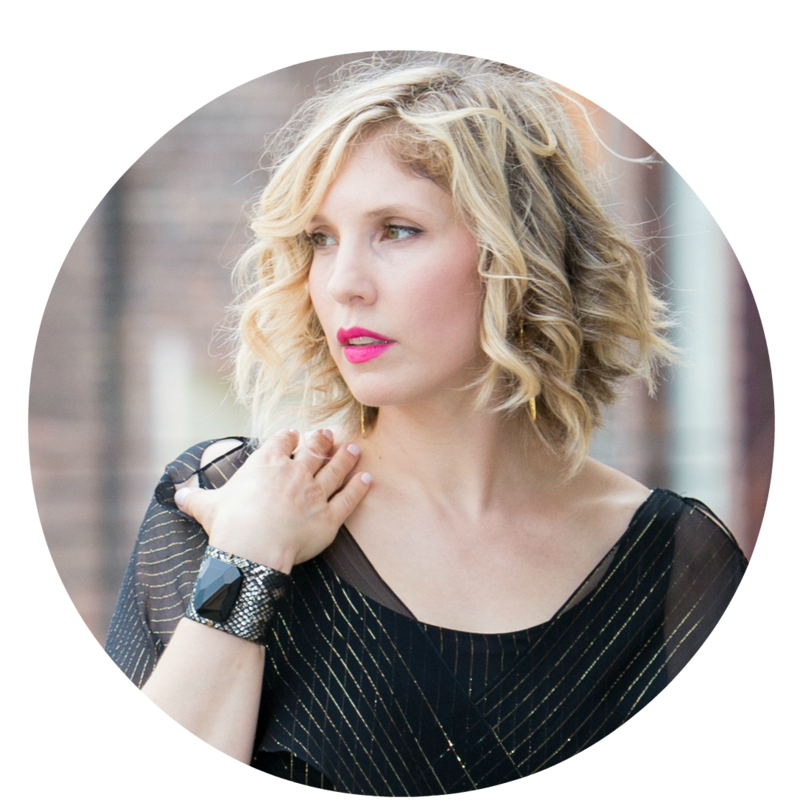 You are my favorite blog for over a year! I *love* how you shop. I'm in the South, so while you're at NOTR, I'm at TJ Maxx (no runway), Target and my fav Goodwill. I look for labels, but it's just much harder to find :) I love that you have kids, but still find "you time" shopping and getting your hair done. Keep shopping so I can shop vicariously through you!! Thank you so much. Sometimes I feel like I'm talking to myself here LOL. Southern women love labels too - if they aren't showing up at your thrift stores they must be somewhere :) Do you have any local higher end consignment stores? Most of them have crazy end of season sales. And sometimes you need to drive a little further out. I may not go often but I have places I go to 45 minutes away. Even if I strike out it's usually an adventure. Most importantly, always ask other thrifters where they shop - that's how I've found some of my favorite haunts. Good luck!